Believe it or not, the Puddinette didn’t go all crazy-times on Black Friday this year and head out at 2 AM to cage-fight other normally reasonable, moderately tempered but momentarily psychotic adults for the newest, hottest “Baby Meth Head”, Fijit, I’ve-Got-The-Uh-Oh-Feeling-Elmo, or whatever the must-have item of the 2012 shopping season happens to be. That’s not to say we didn’t score the Mad Phat Dealz, because we did. But as it turns out, most of said deals were available online, too. You know, which meant clicking a “Buy Now” button while shopping in her jammies, which, I think anyone would agree is a better procedure than the alternative. At any rate, the bargains we were interested in were all online, for which I was a very happy camper. Because no one should have to go out in that nonsense. Camping out for three days – and missing Thanksgiving in the process – for bargains is, in my not-so humble opinion, ridiculous. I mean, I guess I can see how it might seem fun if you’re into that sort of thing, but the cons far outweigh the pros. Oh, and think about this: if I pitched a tent in a Best Buy parking lot for three days in the middle of July, I’d be charged as a vagrant or something. Oh, hello there. Why, yes, I have rambled quite far enough off topic so far that you can’t even see it from here via satellite. Admit it, you totally missed me in November, right? Anyway, as with any Black Friday endeavor, one of the things we acquired was a family purchase more than an intended Christmas gift. We’ve been needing a decent TV for the recently re-organized basement area. Once acquired, this new arrangement would allow me watch movies in the wee hours of stupid late o’clock – which I’m wont to do – with all the Dolby Digital goodness cranked up past 11, completely without fear of waking up the household. And so a brand-spanking-new LED HD TV was ordered and delivered just in time for me to watch the Expendables 2 in all of it’s Blu-ray glory last Friday night. Which, obviously means it’s time to give you 100 words or less about it. It’s pretty much the same as the first The Expendables*. Done. 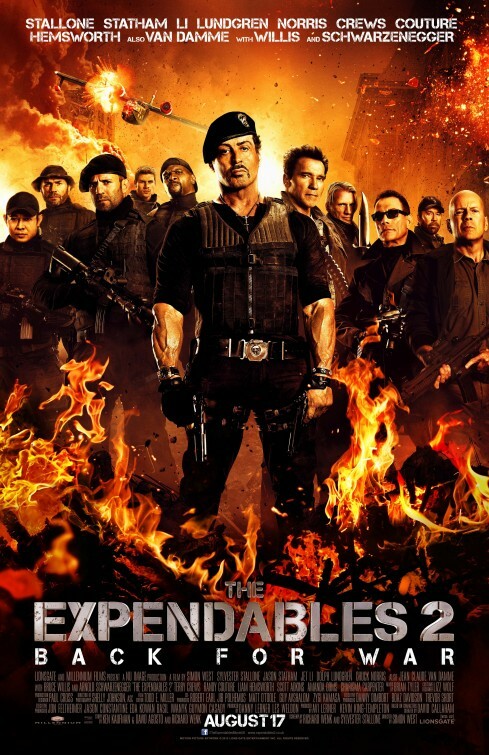 What you get from The Expendables 2 depends on your expectations. It’s a Big, Loud Action flick where stuff goes “BOOM!” while you cheerily munch popcorn. Lather, rinse, repeat. It’s not a thinker. Actually, I’m not sure they hired writers at all, so just don’t think about the plot. If you do, you’ll end up in a twisted rage like Professor Snape facing of another year of Potter’s hijinks. Instead, crank it up, stop thinking for a while, and just watch as, well, everything blows up. Bonus points because the Chuck Norris cameos are hilarious. I realize that’s not exactly a glowing recommendation. My advice to you is, make sure you’re okay losing the 103 minutes of your life this movie’s going to consume before you sigh up. It’s fun ride, but just like mudding on a four-wheeler, it’s probably not for everyone. *W00T! 88 words to spare! That’s my shortest “movie in 100 words or less” post yet! See how easy this is? i love the movie expendables 2, the action and fight scene are really nice..
because setting to your Las Vegas NV marriage ceremony, reception and honeymoon. Russo occurred, and usernames are again safe and secure.